Recline fasteners and metal screws on both sides of the high chair can loosen and fall out, allowing the seatback to detach or recline unexpectedly. Children can fall backwards or fall out of the high chair and suffer bumps and bruises to the head, abrasions, cuts, and bruises. Detached hardware also poses a choking hazard to children. This recall involves about 643,000 Evenflo Envision high chairs, including model numbers: 2891321, 2891321A, 2891333, 2891351, 2891351A, 2891365, 2891375, 2891403, 2891403A, 2891466, 2891466A, 2891478, 2891536, 2891536A, 2891573, 2891586, 2892351, and 2892351A. The model number can be found on a white label on the seatback. "Evenflo" and "Envision" are printed on the front of the tray. Juvenile product and mass merchandise stores nationwide, including Toys "R" Us, Babies "R" Us, Kmart, and Burlington Coat Factory from December 2002 through April 2006 for between $80 and $110. 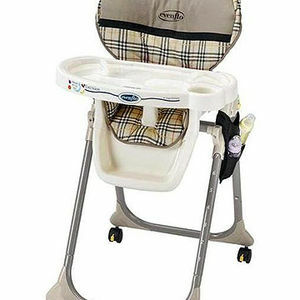 Immediately stop using the recalled high chairs and contact Evenflo to receive a free repair kit. For more information, contact Evenflo at (800) 233-5921 between 8 a.m. and 5 p.m. ET Monday through Friday, or visit www.evenflo.com.